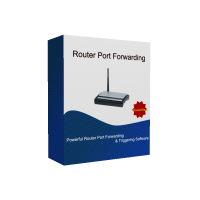 Router Port Forwarding is a very powerful port forwarding and port triggering software for router. 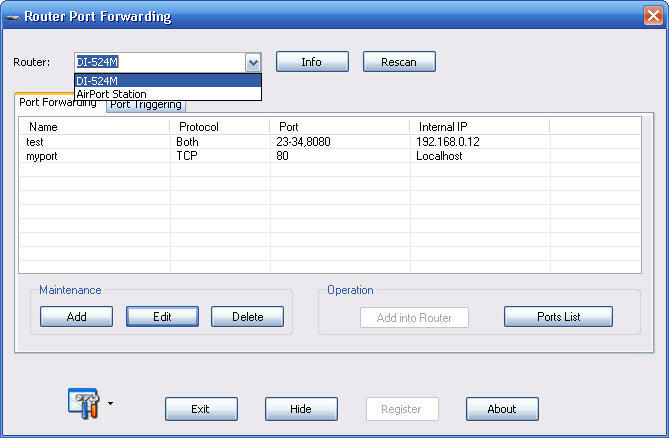 You can easily add, delete, view port forwarding entry of router. The tool can detect multiple routers on your network. Port triggering function is supported too. 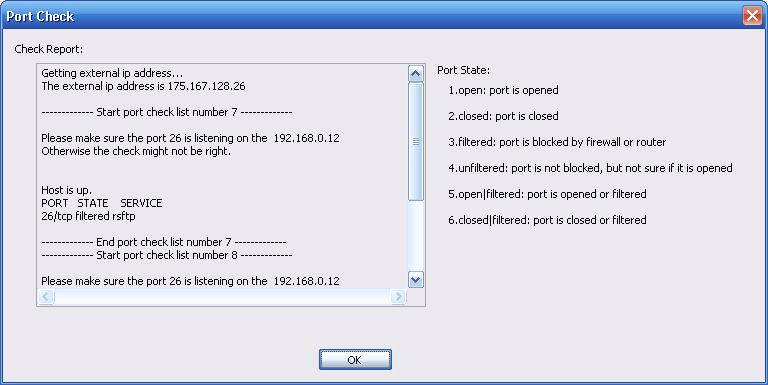 At the same time, you can use port check function to check if your port is opened. When the software launched, it will try to detect router firstly. If you have multiple routers in your network. The software will try to find them all and fill in the router list. Then you can click "Add into Router" button to add port forwarding or click "Ports List" button to view port forwarding and do port forwarding check. What is Port Forwarding & Port Triggering? Normally, we surfy internet by using a router. That means our computer behind the router. Our compuer has a private ip address and the router has a public ip address. The requests of our computer will send to the router and the router will rely the requests to internet. This is how we surfy internet. Router is like a front door before your computer. But if internet users or applications want to access your computer, it will reach the router(front door) firstly. If there is no port opened for this request in your router. Your router don't know how to deal with this, So your router will refuse the request directly. This will result internet users or applications can not access your computer. Port forwarding is the right way to resolve this. What you need to do is just add a port forwarding into your router, then your router will know how to forward the request from internet users or applications to your computer that behind the router. Port Triggering is an option of router. Basically, port triggering and port forwarding are the same. They all open a port on your router and when there is connection or data from internet, your router will forward the connection or data to your local computer that behind router. The difference between port triggering and port forwarding is, when you use port forwarding function of your router, your router will always open the port no matter you are using it or not and the internal address be forwarded is static, if you want to change the address that you want to forward, you must edit the port forwarding entry in your router. Comparing with port forwading, port triggering is a little more secure and it is dynamic. When your application need to open a port in your router, the port triggering function integrated with our Router Port Forwarding software will do this for you. When you don't need it, what you need to do is just close the software, this will automatically close the port in your router, this will increase your computer security. 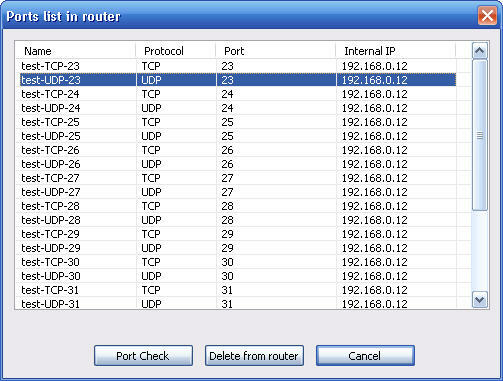 At the same time, port triggering is dynamic, What you need to do is just run our Router Port Forwarding Software with your application on any computer together, this will let your router dynamically forward connection or data to your computer that running your application, you don't need to edit the port triggering entry in your router any more. But the disadvantage of port triggering is unstable, it really depends on your rouer. Your rouer will close the port after some period of time if there is no data pass through. This will break your application down. At the same time, a lots of applications don't support port triggering. So this is the value of port triggering function integrated with our Router Port Forwarding software. It will generate a constant data stream to keep your router open the port for your application. It doesn't matter if that software supports port triggering or not. It doesn't matter how long your router waits before close the forwarded ports, because the data generated by our software is constant. When you adding port triggering entry into your router, you will input a trigger port and a opened port. The trigger port is when there is data coming out from this port to internet, your router will auto open the forwarded port. The opened port is the port will be opend by your router and forward connection or data to your application. Router Port Forwarding 2.6 released.